Michael Waddell is without question the biggest star in the outdoor world. To my gun- and bow-toting brotheron, he’s sort of our LeBron James. Well, except when he was a big-time free agent in the hunting industry a couple years ago, he didn’t do an hour-long show on the Outdoor Channel to tell everybody about it. In fact, hardly anyone knew about it. He’s that kind of humble. He’s gone from a part-time grunt with Realtree Outdoors to the most sought-after representative for every outdoor product manufacturer. He’s developed two brands that carry significant value in the outdoors. And he’s done it by staying true to himself. I respect that very much. He kind of reminds me a lot of Marty Smith with ESPN. Smith is beloved by NASCAR fans because he is different by being normal. Does that make sense – different by being normal? The normal for both Smith and Waddell helped fit a niche that was needed in their respective industries. I remember watching the first-ever episode of Realtree Roadtrips nearly a decade ago. It somehow captured many of the great things about hunting in a way no other show had done before. It also allowed my wife to understand a little bit of how traveling on a hunt with a group of buddies can be so fun! I knew enough about the outdoor world to know who Waddell was at the time Realtree Roadtrips launched, but I knew at that very moment that he was destined for stardom. And I’ve enjoyed his programs and a lot of the things about him ever since. That’s why I’ve been looking forward to reading Waddell’s autobiography, Hunting Booger Bottom – Life Lessons From the Field. If you know much about Waddell, you know the name of the book is a way for him to pay homage to the area he grew up in Georgia. The book is well worth the read and kept me laughing at the right moments throughout its first half. From his upbringings in a rural area of Georgia, to his early hunts alongside his construction-working “diddy”, the first half of the book is very much the storytelling you would expect from Waddell. He then does a nice job replaying his rise through the turkey-calling ranks in order to get an audience with Bill Jordan, which was the start to a full-time career in the outdoors. My favorite story from the book, involves Michael and his father, Edwin, learning how to cook on the heels of Michael’s mom passing away. Without ruining the story for those yet to read the book, let’s just say I chuckle each time my family eats corn on the cob! There is plenty of storytelling for the outdoorsmen to enjoy the book. I have to admit that I felt like I knew a lot of the stories that included hunts filmed for his TV shows, but it wasn’t bothersome enough to make me wish I hadn’t heard the story replayed in words instead of on film! Overall, I give the book a full Boone & Crockett rating (you might recall our rating system from our 2009 Gift Guide!). 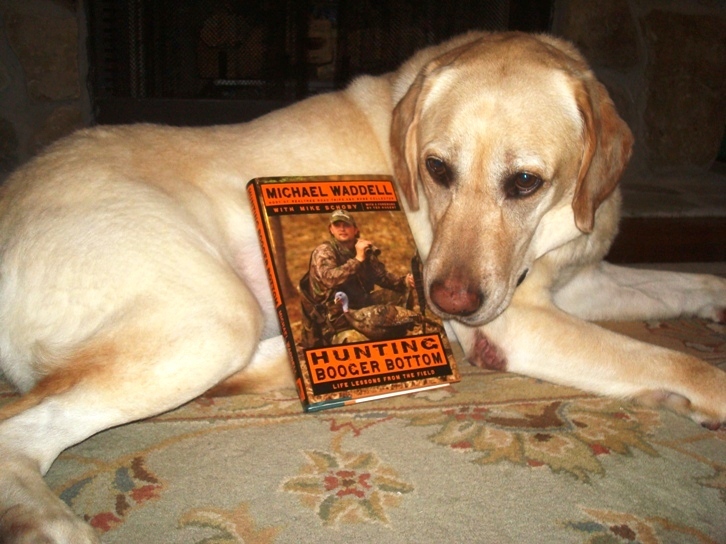 Waddell makes Hunting Booger Bottom well worth the read. One quick point for Michael though: I PROMISE not all Northerners are like those you met and correctly dismissed in Maine. Where I come from (Western New York), we’re a whole lot like all the good country folks you’re used to down in these parts! Click here to learn more about ordering the book. It drives me nuts to read other hunters bash Waddell (and many other known outdoorsmen) on outdoor forums. Most of my fiery comes with the fact that the primary root to all of the griping is jealousy. People whine about Waddell and other hunters as if they were personally stealing the deer they’d been chasing all hunting season. With very few exceptions, it is hunters like Waddell, the Parkers, the Ciancirulos, the Drurys, the Lakoskys, etc. that are helping position our sport for a better future. Call it selling out, I call it raising awareness. If you’ve read many of my posts, you know I’m extremely concerned about the future of hunting in our country. If it takes some of these folks to become full-time hunters to help elevate our sport, I’m going to do nothing but support it. Are any of them the best hunters I’ve ever witnessed? It doesn’t matter. I can say that I’ve hunted with a couple, and met many, and can say that most of them are just like you and me. This entry was posted on Sunday, July 11th, 2010 at 8:46 pm	and tagged with Booger Bottom, Hunting, Hunting Book, Michael Waddell, Realtree, RoadTrips and posted in 2010, Book Review, General Tales, Product Reviews, Uncategorized. You can follow any responses to this entry through the RSS 2.0 feed.